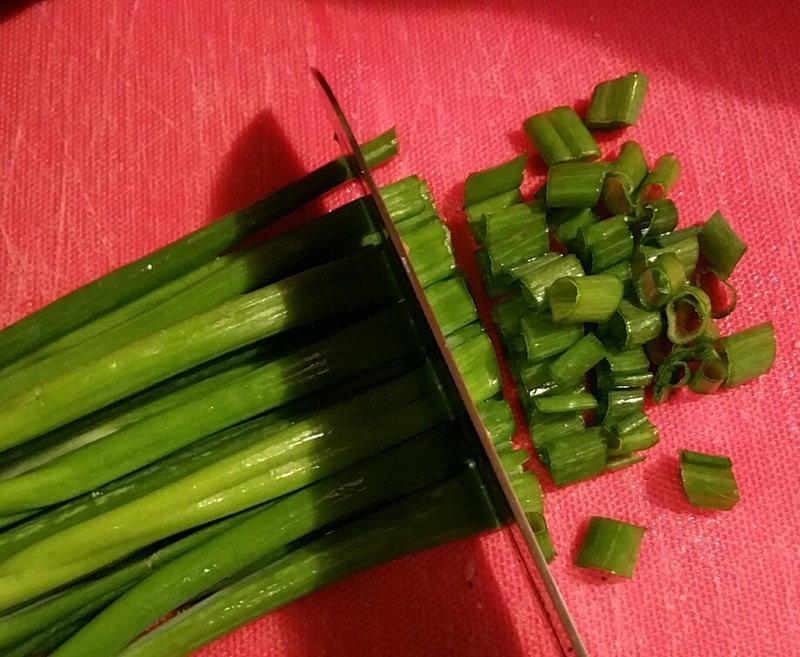 for a salad recipe!” – Laura K.
The evening before my first brunch, it occurred to me that the only items on the menu my two gluten-free friends would be able to eat were the steamed asparagus and fresh strawberries. I searched online for a recipe that would use ingredients I already had on hand and found a recipe for a kale salad that had roasted vegetables and lentils. Yum. 90 seconds in the microwave (now that’s MY idea of cooking dinner after a long day at work). 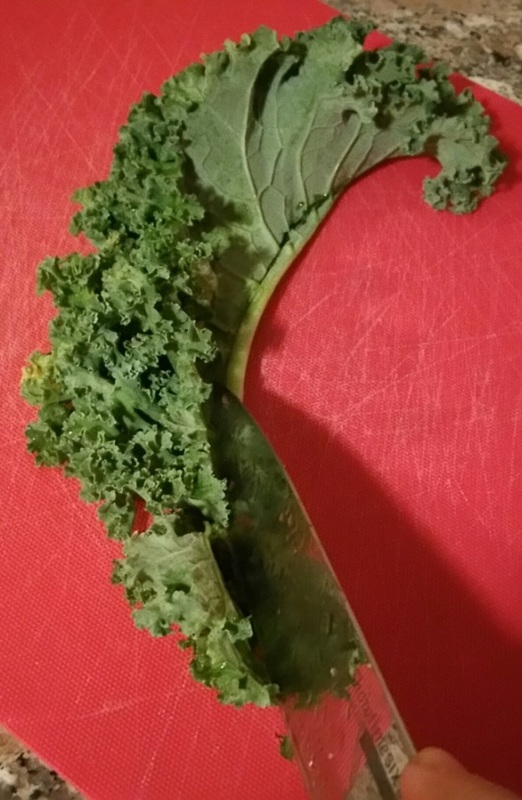 Tell you what, it was the perfect ingredient for my kale salad. Time to get another case. 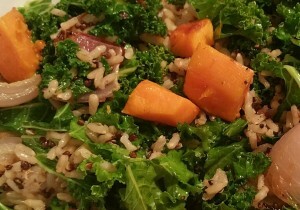 Here’s a link to print the recipe for Kale & Roasted Sweet Potato Salad, and below is a step-by-step description of how I made it. I recommend this salad for any meal. Delish! Peel and cube a large sweet potato. 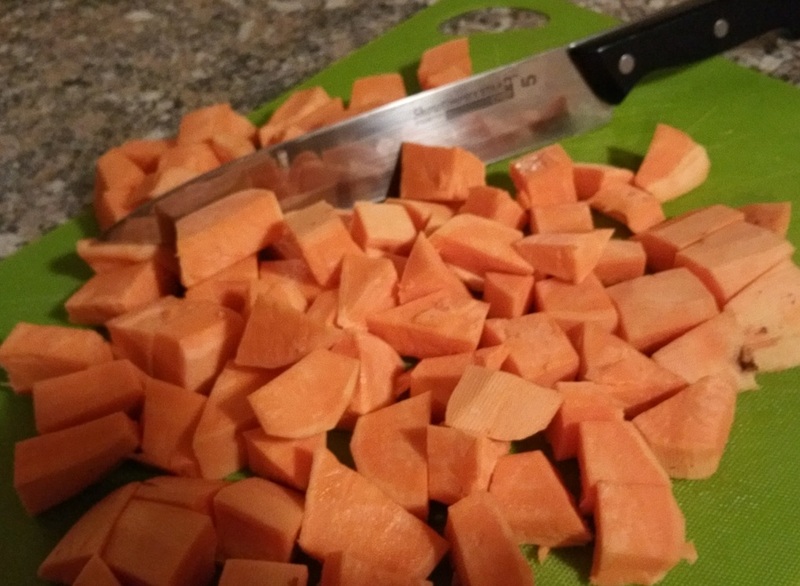 You can use any kind, but I prefer the jewel sweet potato because its color and flavor are yam-like but it has the high fiber of a sweet potato. 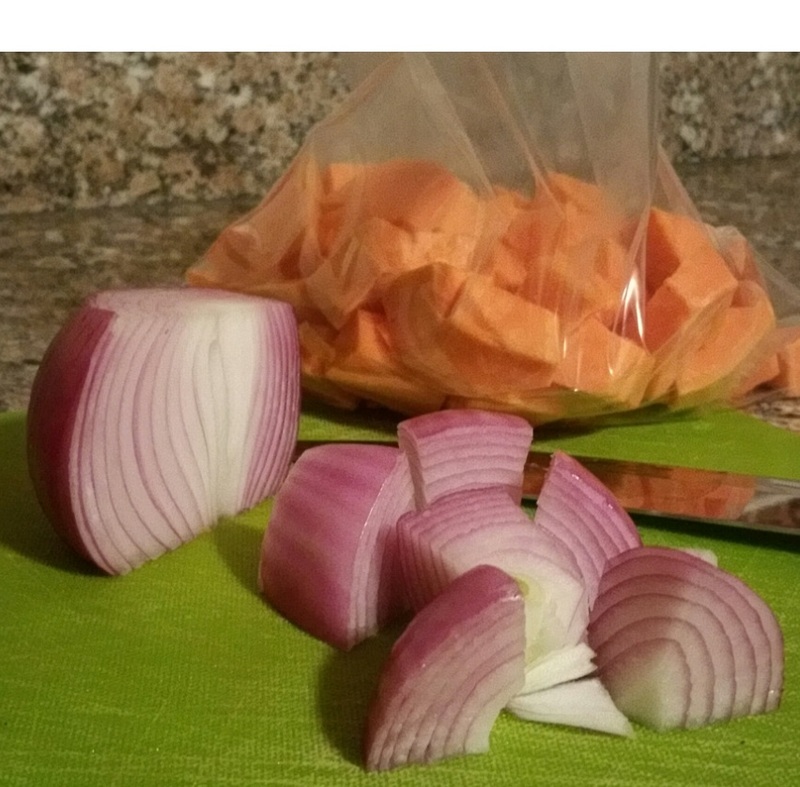 Chop a red onion into large wedges. 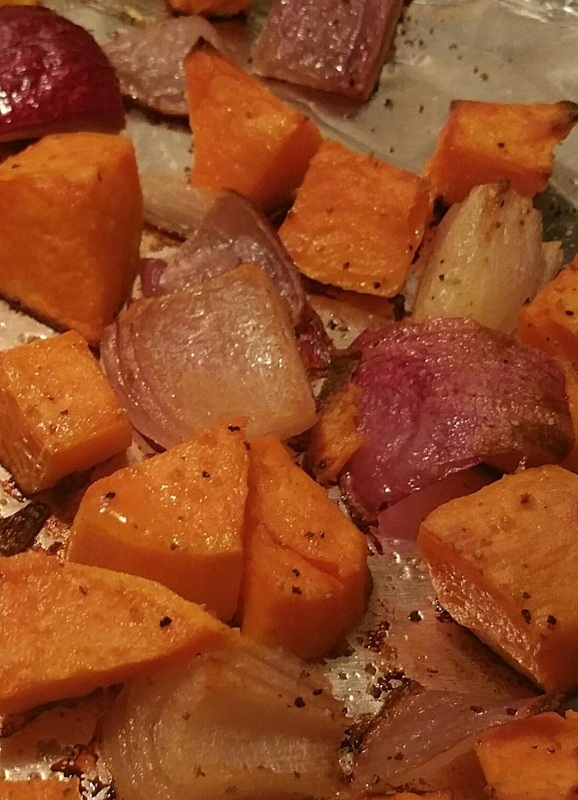 Toss the sweet potato and onion with 2 tablespoons of olive oil. 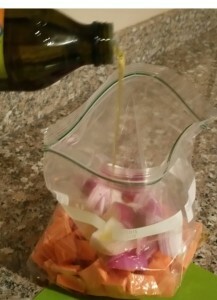 I find it easiest to put the vegetables and oil in a plastic bag and kneed the veggies to coat evenly. 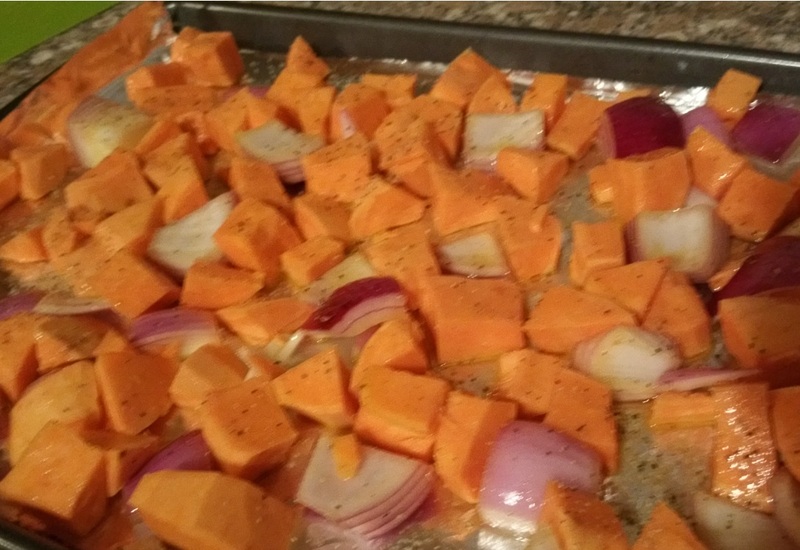 Spread the vegetables on a baking sheet covered with foil and season to taste. 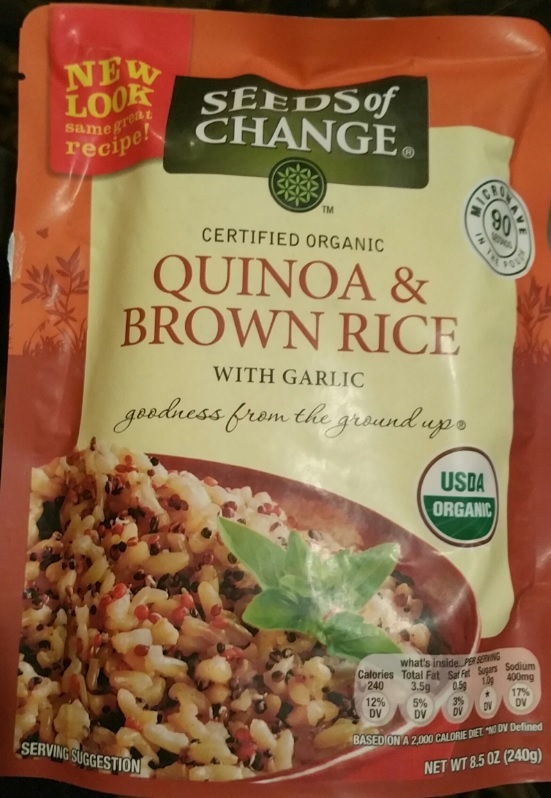 My seasoning of choice for probably half of everything I cook is McCormick’s Garlic Pepper. That’s all I used on these veggies and I can’t imagine them tasting any better. Roast for approximately 40 minutes until veggies are tender and edges are nicely browned. Remove and discard the tough kale stems and slice the curly leaves into bite-sized pieces. 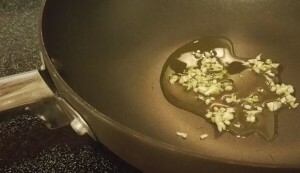 Add two tablespoons olive oil and one finely minced clove of garlic to a saucepan over medium high heat. Sauté until garlic is tender and slightly browned, about two minutes. 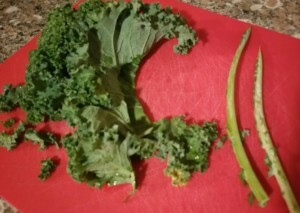 Add the kale and cook until it is wilted but still slightly crunchy, about five minutes. Tear open a packet of Seeds of Change Quinoa & Brown Rice and microwave for 90 seconds. 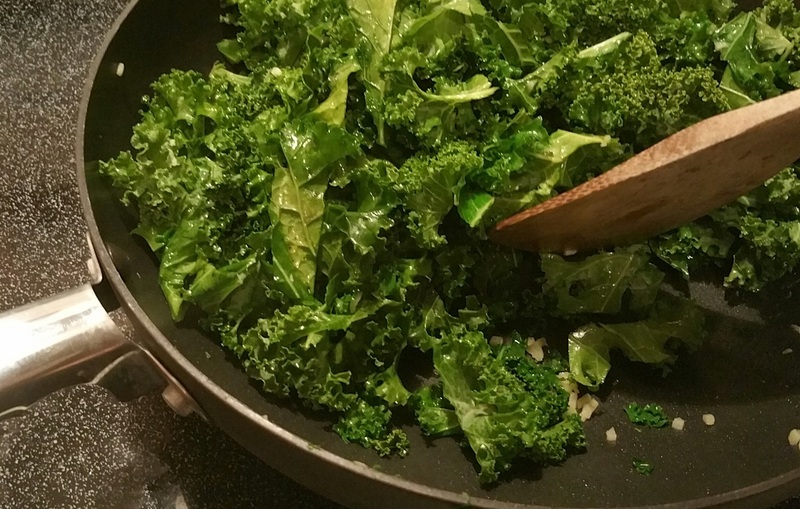 Pour contents over kale. Combine roasted veggies, kale and quinoa and brown rice. Serve warm or chilled. invest in silverware and plates, etc. so that I’m not adding to the landfill each month. recommend: Webstaurant Store (I’m not an affiliate or making any money off this referral — just letting you know a great place to find kitchenware). I was able to get a nice set of flatware, so no more plastic forks and spoons. It’s classier and kinder to Mother Earth and well worth the investment. The fail… I went cheap on the plates, cups and bowls. I bought these plastic dishes called Fineline Flairware. They are definitely classier than paper products, so for a wedding or something like that, they would be a fine choice. But for my purposes of having monthly brunches, they are not durable enough. After just one brunch, I had to throw away 8 of the 22 plates that had been used because they had cracked or split. So worse than throwing away paper plates, which would at least go into the compost, now I was throwing away plastic! Yes, I put them in the recycling, but I’m not a fan of the whole plastic recycling process because it uses resources (water, electricity, etc.) and produces its own toxins. Better, maybe, than the landfill, but still… recycling plastic after just one use? Unacceptable! Of the 10 bowls and 15 cups that were used that day, none of them cracked, so that was good. The cups stack compactly and handle both hot and cold beverages, but they definitely feel disposable. I will keep using these dishes until they’ve worn out, but I don’t recommend them if you are wanting items to use again and again. Oh, one more item: disposable serving utensils. I got serving spoons, forks and tongs from my local party supply store (and there’s an Amazon link to them below). They worked well, looked nice and were inexpensive, and I’ve used them several times without noticeable wear. Still, in the future I will invest in the real thing (from Webstaurant Store), but if you are only doing a party once in awhile, they are an inexpensive choice. I’ll keep sharing my experiences with various products and services relating to brunching, but I’d also like to hear your recommendations (or warnings) of products and services you’ve used. The first word of this blog is Simple. 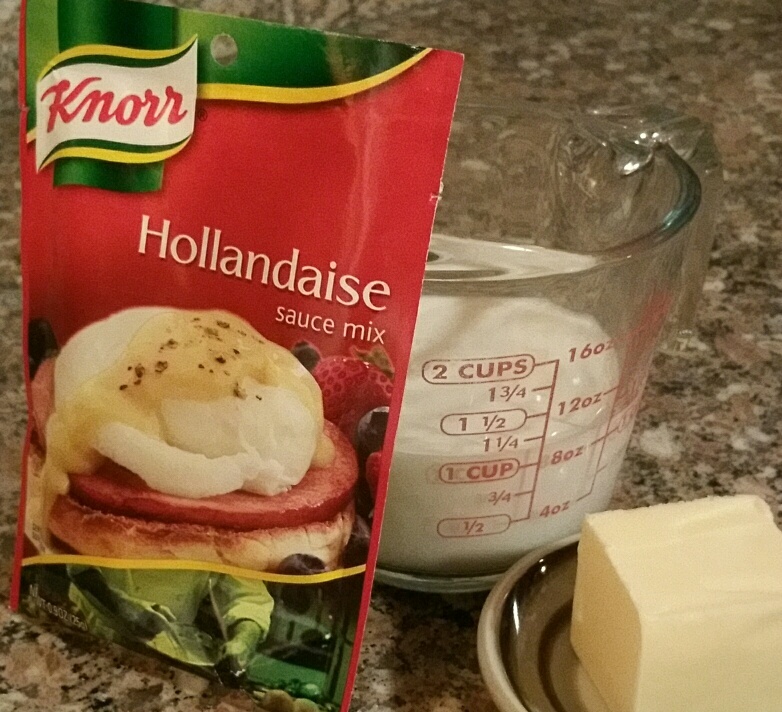 If you’re wanting an authentic eggs Benedict with homemade hollandaise sauce, you’re sure to find many a great recipe on Google. 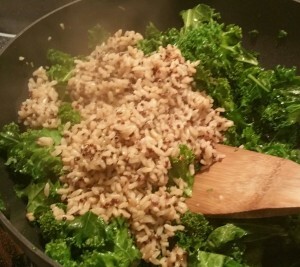 But below is a very simple, tasty and lovely casserole version of this dish. Click here to print the Eggs Benedict Casserole Recipe or read on for step-by-step instructions. 1. Eggs Benedict is traditionally made with Canadian bacon, but I like the rich juiciness of ham. So the first step is to dice 12 to 16 ounces of ham into half-inch cubes. 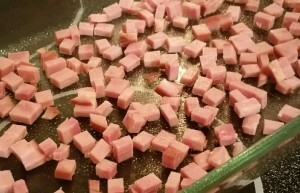 Sprinkle half the ham into a 9×13″ baking dish prepared with cooking spray. 2. 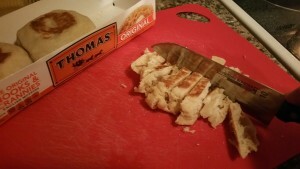 Cut six English muffins into small pieces and layer them on top of the ham. 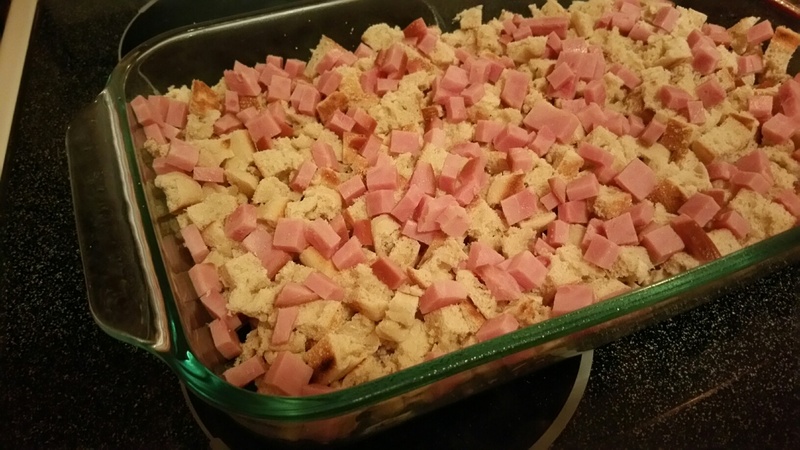 Then layer the remaining ham on top of the muffins. 3. In a large mixing bowl, wisk together 8 eggs, 2 cups of milk, 3 chopped green onions, 1 teaspoon onion powder, and one teaspoon salt. 4. Pour egg mixture over the ham and English muffins. Cover with plastic wrap in put in the refrigerator overnight. sprinkle paprika over casserole. Cover with aluminum foil and bake 30 minutes. 6. 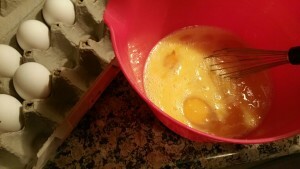 Remove foil and continue baking until eggs are completely set, about 15 minutes. medium saucepan. Add 1/4 cup of butter and stir over medium heat until it comes to a boil. Reduce to low heat and stir until thickened, about 1 minute. 8. 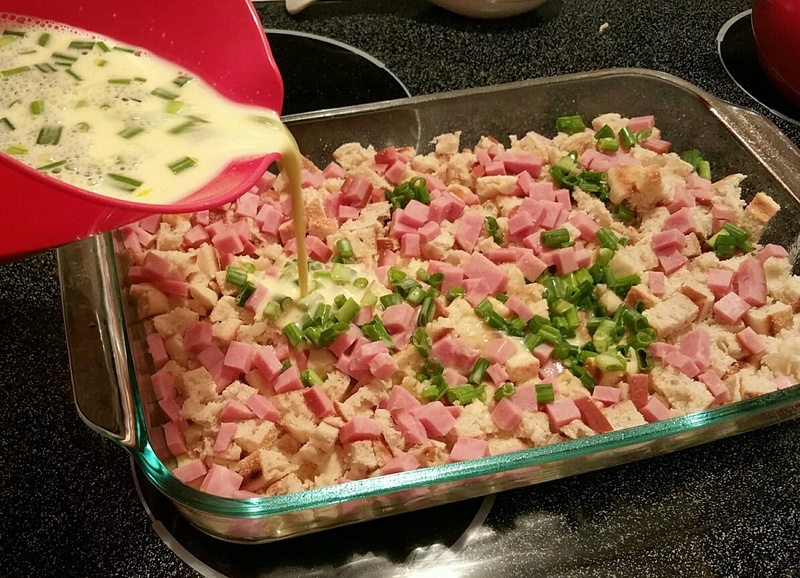 Drizzle sauce over casserole and serve. Enjoy this and the many other easy brunch recipes to come. G’mornin’ all! How exciting to be starting my first blog! I’ve got so much to learn, so please bear with me and give me your gentle feedback. Well let me tell you!! The first brunch was a smashing success and such fun. And my house is looking wonderful. I learned so much in the process and am sure I will learn more in the brunches to come, so I decided to use a blog to document my process and to hopefully inspire others to make brunching with friends a regular event. In future posts I’ll be sharing easy brunch recipes, shopping lists, food prep timelines, invitation designs and decorating tips. I look forward to hearing from you with questions or other topics you’d like me to cover.